Vanchinos, 320 St Albans Road, Watford, Hertfordshire, WD24 6PQ have now been awarded our highly revered Good Food Award – Gold Seal for 2019. Our Gold Seal is the highest accolade bestowed by the Good Food Awards and is reserved to those achieving our award for three consecutive years or more. Premises must maintain the same exceptional standards that gained them initial entry into our awards over a three year period. Truly making this achievement the marque of distinction. These premises have demonstrated exceptional levels of food quality, service and value when compared to our industry benchmarks in their category and have now maintained this formidable standard for three or more consecutive years. 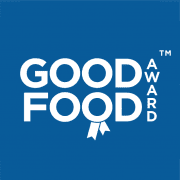 In recognition of this achievement they have been duly awarded our highest accolade the 2019 Good Food Award – Gold Seal | Good Food Award Winners in 2017, 2018 & 2019. To provide fresh tasty food and service of which we would expect ourselves. This is a new family run venture, after working 20 years in the food industry, we have decided to follow our dreams. The name started when Mimi on taking her children home to Bulgaria to see their Grandmother whom they call Baba Vanchy would always rather she cooked for them instead of eating out. They named her Kitchen Vanchino’s so when asked about eating they always asked to go to Vanchino’s and this was where the name was born.